Leah Schade’s article in Patheos paints a beautiful portrait of what the ELCA Gathering was this year for people coming from places (such as her home, Kentucky, and my home, Idaho) where ELCA Lutherans are not the majority. 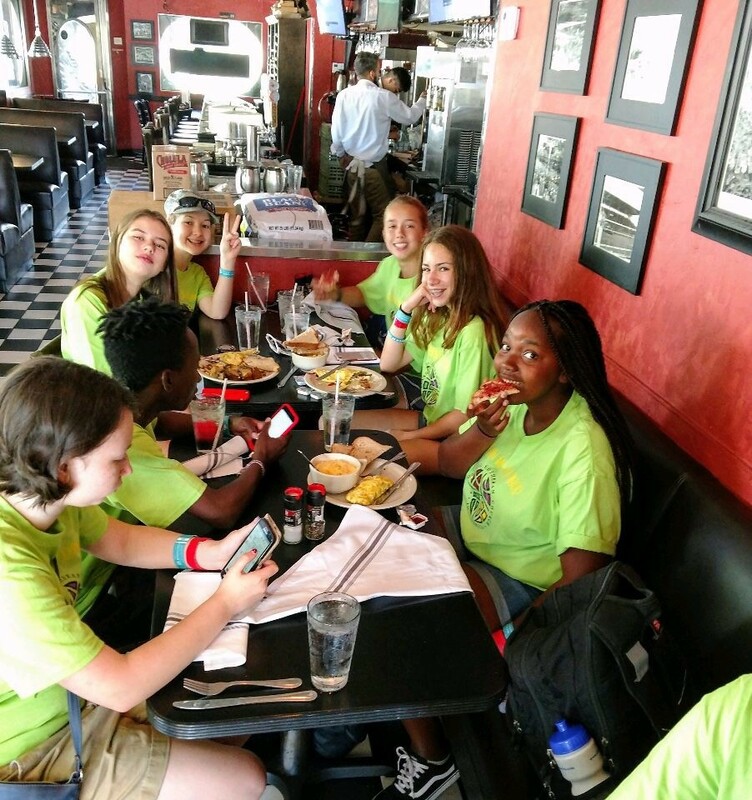 My colleague Casey Cross did a great job in her Gathering Roundup of describing the experience the youth and adults from Hope, Trinity, Redeemer, Faith, and St. Paul had. I commend their articles to you. My Gathering 2018 wrap-up is going to introduce you to seven specific people/memories/moments. The DJ at the Mass Gatherings – I cannot find his name anywhere but this guy was amazing and so well prepared. Thanks to the television show Glee and the multitude of parents who have introduced their youth to earlier music, we were all, multiple generations, belting out classics like Journey’s Don’t Stop Believing and Queen’s Bohemian Rhapsody. We also sang This is Me from the film The Greatest Showman. What a gift to share this singing with the youth. It truly energized us. Thanks DJ. The amazing night desk manager, SooJin Han, at The Whitehall Hotel- I regret not taking a photo of this woman. I asked her for a few places we could go for brunch, with a group of 16, and have an authentic Houston experience. She sent us to the District 7 Diner one morning and Harry’s Restaurant another morning. Both meals were delicious. We supported local establishments. We did not have to wait long. Then I came to her asking about where we could purchase souvenirs and she suggested we go to the Houston Zoo gift shop, one of the stops on the Metro between our hotel and NRG Park. 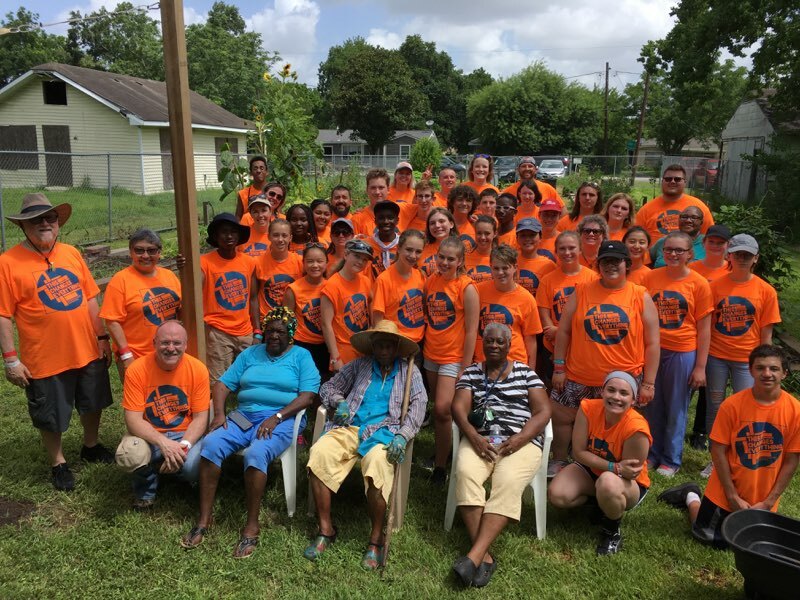 Ms. Johnson – One of the things I loved about our Service Learning Day was meeting the people who coordinate and volunteer regularly in the Harry Holmes Healthy Harvest Community Garden. Long-time volunteer Ms. Johnson was asked how long she had lived in Houston and she clarified that she lives in Sunnyside, a neighborhood south of downtown. With groups from Idaho, California, Pennsylvania, and New York. A Servant Leader – None of our previous posts have talked about how transportation home at night was sometimes challenging. The first night, the Houston Metro simply was not prepared for the number of people heading back downtown. Night two was super smooth because the Gathering staff and city fixed the problems. Then, the next day, a semi-truck hurt part of the track so it could not run at a high capacity. On one of the evenings we were standing in a long line of participants, we saw ELCA Youth Gathering Director Molly Beck Dean. This was the high stress-point of the Gathering at that moment and here was the leader supporting her volunteers, showing them that she had their back and was working with them to find solutions. As someone who has volunteered at four Gatherings, this made a big impression on me. The woman in the car – After brunch at Harry’s Restaurant, we headed to the closest Metro stop. We were wearing our turquoise Treasure Valley Cluster matching shirts and I was the last person to cross the street, sweeping the group. A driver leaned out of her car and asked me, “Is this the Gathering?” I answered a quick yes and she said, “That’s wonderful.” This was Saturday morning and I knew the Gathering had been featured at least once on a local news station and in the local newspaper. It was fun hearing a Houstonian make the connection between our bright colored matching shirts and the positive press. In our turquoise shirts at Harry’s Restaurant. Vestments Photo Booth – Speaking of photos. I have a soft spot for the interaction center because my parents coordinated it for many Gatherings. 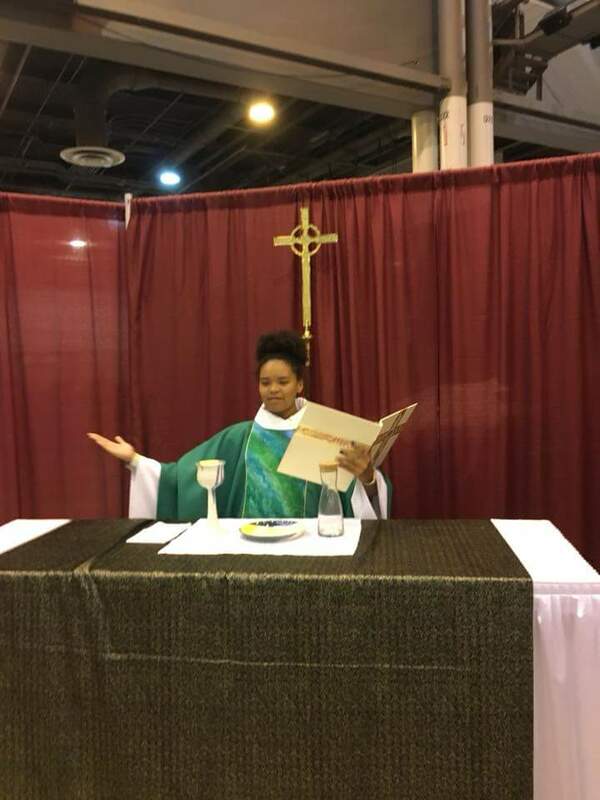 It was in fine form at this Gathering and what epitomized it for me this year was the Vestment Photo Booth organized by the Worship Team of the ELCA. I ran into a pastor who moved away from our synod and he could not wait to show me photos of the youth from his church dressed up as pastor. How brilliant! The Interactive Learning Center is supposed to be a place for youth to experiment, learn, ask questions, and play. Well done ELCA Worship Team! I also heard great things about People on the Move: A migrant and refugee experience (put on by AMMPARO), conversations Lutheran Outdoor Ministries volunteers had with youth and adults about camps, and the ELCA World Hunger booth. On the bus ride home I listened to some of the podcasts recorded in the Interactive Learning Center by To hell with the hotdish! Claire, pictured here, will be a sophomore at UW-Madison. She’s been told she will be going to seminary one day soon. The Final 15 – It does not matter how exhausted I am. I love the Final 15, the time each day when Casey, Ken, and I asked the youth and one another to reflect aloud on the day. Sometimes we used the questions offered by the Gathering and sometimes we simply asked people to share what they appreciated and what was challenging. I have been a camp counselor, taken youth to four ELCA Youth Gatherings, talk often about how we never give kids and young adults enough credit for what they are absorbing in any given situation. I may no longer be astonished but I am always gladdened by what they say in that holy time of sharing. 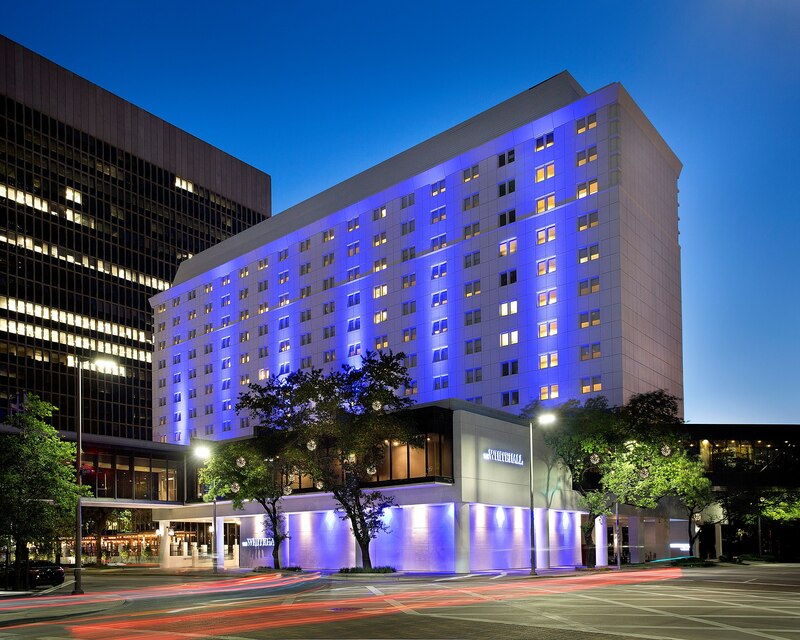 Their gratitude for the hospitality shown by the people of Houston and the Gathering volunteers, their delight in things like air conditioning and flavorful food, and their insights into what the evening speakers were communicating all brought me the deepest joy.